Choose books about topics, problems and behaviors that don't have a single or a simple solution. This leads to great opportunities for discussion. Choose books that your child may not select on his or her own, maybe a classic story that you loved as a child, maybe a book or story from your family's cultural heritage. 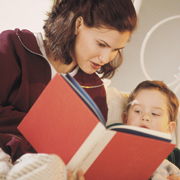 Look for books about unfamiliar things that open up the world to your child. Find books about familiar things or books by favorite authors. The youth librarians are skilled at helping you and your child choose the books that are just right.